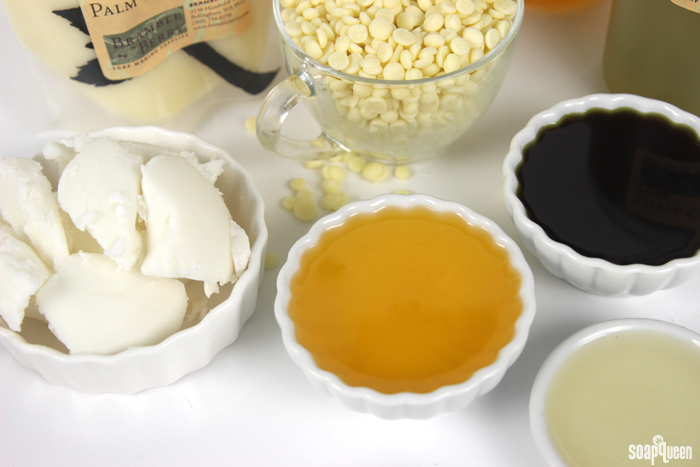 One of the benefits of making your own bath and beauty products is having complete control of the ingredients. 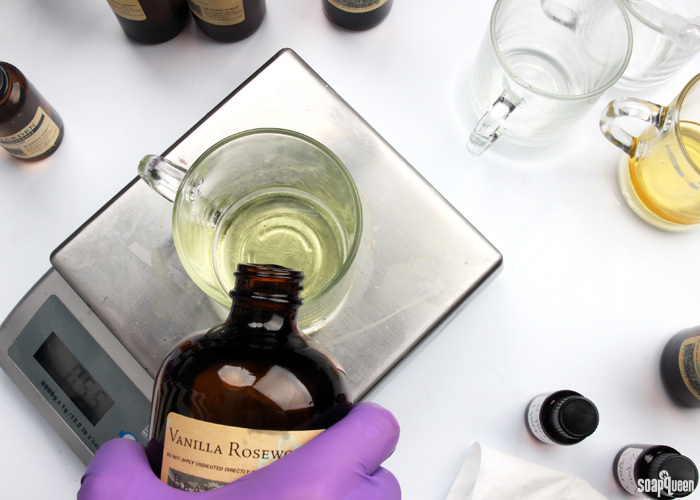 Whether you have sensitive skin, allergies or prefer to avoid particular ingredients, creating products from scratch allows you to fully customize for your personal preferences. If you or somebody you know has severe allergies to products such as nuts or gluten, creating your own bath and beauty products can be especially appealing. If you have concerns regarding specific ingredients and how it will affect your allergies, it’s always best to consult with your doctor. Tree nut allergies are one of the most common allergens in both adults and children. Tree nuts include (but are not limited to) walnuts, almonds, hazelnuts, cashews, pistachios and Brazil nuts. Peanuts are also a common nut allergy, but are technically considered legumes. According to FARE (Food Allergy Research & Education), people who are allergic to tree nuts are more likely to be allergic to other types, and should avoid all nuts. Some fixed oils used in bath and beauty products are derived from nuts, such as sweet almond oil and hazelnut oil. If you are allergic to nuts, you may want to completely avoid using oils from nuts. While these oils are bath and beauty products and are not being consumed, FARE states, “Tree nut oils may contain nut protein and should be avoided. Tree nut oils are sometimes used in lotions, hair care products and soaps.” It’s always better to be safe than sorry, so if you or a customer are allergic to nuts, you may want to avoid these oils in your projects. If you are unsure if you should use oils derived from nuts in your products, contact your doctor. A great substitution for both sweet almond oil and hazelnut oil is apricot kernel oil. Some oils are derived from nuts. If you are allergic to nuts, you may want to completely avoid using oils from nuts in your bath and beauty products. It’s important to talk to your doctor to help make the right decision for you. Hazelnut oil and sweet almond oil are easy to identify as nut derived. But others, such as argan oil and coconut oil, are a little harder to define. If you are allergic to nuts, should you avoid these oils? Below are statements from FARE regarding ingesting coconut oil and argan oil. If you choose to not consume these oils, you may want to talk to your doctor about using them for bath and beauty products. While less common than nut allergies, allergic reactions to seed-based oils (such as chia seed, sesame seed oil, etc) are also possible. Remember, if you’re unsure which oils are right for you, contact your doctor. Seed Allergy: “Some seed oils are highly refined, a process that removes the proteins from the oil. However, as not all seed oils are highly refined, individuals with a seed allergy should be careful when eating foods prepared with seed oils.” Click here for source. 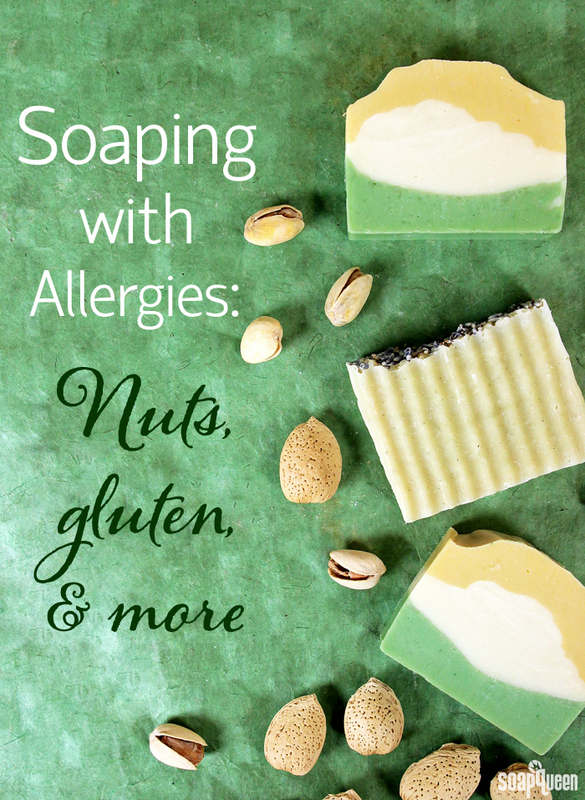 Nuts are a common food allergy, and nut based oils are a common ingredient in many soap recipes. Some people with nut allergies may choose to avoid these oils. Another common ingredient sensitivity pertains to gluten. Most bath and beauty ingredients are gluten free and vegan, though you will want to check the INCI for the exact ingredients. We actually have an employee with celiac disease and have thoroughly researched our products to ensure her safety! With that being said, many suppliers, including Bramble Berry, cannot rule out any cross contamination. For most people with celiac disease, using skin care products that contain gluten is not an issue unless they products are ingested. Bramble Berry’s warehouse is not a food safe environment and our products are only meant for cosmetics. This article from the Mayo Clinic has a great explanation about gluten and bath and body products. If you have any questions about which products are right for you, consult with your doctor. While fragrance oils are thoroughly tested to be skin safe, they can occasionally cause skin irritation. While you may not have a serious allergy like nuts, seeds or gluten, some ingredients may cause skin to become sensitive. Everybody’s skin is different, and sometimes skin can become irritated to totally random things! Because of this, it’s impossible to know if you or your customer’s skin will agree with every single product and ingredient. If your projects are not only for personal use, it’s important to label the ingredients on your products to help consumers avoid particular ingredients based on their own personal sensitivities. If you are looking for more information on how to label your products, check out the posts below. In addition, I recommend reading the labeling regulations for cosmetics on the FDA’s website. Another source of skin sensitivity when soaping can come from fragrance oils. Fragrance oils do not have full ingredient disclosure; they fall under “Trade Secret” status with the FDA and so simply putting “Fragrance” on an ingredient list will suffice. All ingredients in fragrance oils are tested for irritation, and more serious issues such as carcinogenic indicators. While fragrance oils are tested thoroughly, it’s still possible that the fragrance oil could cause an allergic reaction for a select few. If you are a customer has an allergic reaction to a product, you may try making it without fragrance oil, with a different fragrance oil or with an essential oil. It’s also important to use the correct amount of fragrance and essential oil, as too much can be irritating in products. You can use the Bramble Berry Fragrance Calculator to find out how much to add to your products. It is not possible for a cosmetic to claim to be “nonallergenic,” because everybody reacts differently to ingredients. By properly labeling your products, consumers who are allergic to specific ingredients are able to make informed decisions on the products they use. If you are concerned with the ingredients in your products, whether they are store bought or homemade, consult with your doctor. The original Castile Soaps were made with olive oil (years ago). Currently almost all Castile soap flakes are coconut based. Assume any soap today contains coconut, unless it specifically states that it is made 100% with something else. And, be careful of the carrier oils used in essential oils, as nuts are everywhere. I just recovered from 3 weeks of painful rash from an essential oil that used hazelnut oil as its carrier. Biologists may classify coconut as a “drupe”, but they also classify as drupes; almonds, walnuts, pistachios, macadamia nuts, cashews and pecans. According to everyone (except biologists) all of these are nuts. Remember classifications are just created by humans to organize flora and fauna. Every year a number of plants and animals are reclassified. So just go with what your eyes and body tell you, a tree nut is a tree nut weather it is called a seed, a drupe or a nut. And your body responds to them all in the same painful way, if you are allergic to them. Best of luck to everyone, and happy soaping. I was wondering if the saponification process in cold process neutralizes the nut oils in any way so as not to be of much concern for people with nut allergies. I use sweet almond oil and it is always added to my main batch of oils, then combined with the lye. I do not add it later. I do however, usually do a 3 to 5% superfat calculation in my recipes. I’m still searching for a suitable alternative to coconut oil in CP recipes that won’t make a Castile or 100% olive oil bar. I’d really like to make something I can use various oils in for their specific benefits but I want to stay “allergy friendly” and avoid nut oils, gluten, and soy. Any ideas? I found that Babassu oil has similar properties to coconut oil and is made from seeds rather than nuts so it may be a safe bet. I’m going to do a small batch to try. I will also check out that forum. Thanks so much! Hello! I am currently working with a client who has a pretty severe coconut oil allergy. Now I have already figured out a simple recipe, but I’m struggling with finding any really good information on the cross contamination of using the same equipment for both recipes. I’m worried that even with the normal cleaning of my work space & equipment, that there may still be trace amounts of coconut oil left on them after cleaning. I hate to just give up on the project, but am also giving myself a headache over all the variables in a situation like this one. I wouldn’t be as concerned if it were more of a sensitivity issue. I’ve even figured that I can buy and dedicate specific equipment for this project, but I’m also concerned about cross contamination where the oils are processed. Hoping that someone might be able to point me in the right direction. Thanks a bunch! Great article! Your posts on how to formulate practically all sorts of personal care products have been wonderfully helpful. Despite my super sensitive skin, this formulation has been a life-saver. My family and friends have also noted the improvement on my skin and asked to try. My sister, upon trying it, had a minor allergic reaction with small red bumps. A friend of mine did a patch test on her arms and she broke out in hives that felt hot. I have searched all over to understand what could be the reason. There are no nut-based carrier oils in this recipe. Could it be the essential oils? 1. With natural skincare does it come with the territory that 1-5% of your sample size are expected to have mild to serious allergic reactions? 2. With my formulation is there any red flag (ie ingredient or combo of ingredients) that would raise the occurrence of allergic reactions above what’s expected? That recipe sounds awesome. I have the same skin as you, so I’m excited to check it out! If your friends and family are having sensitivity to the product, I would recommend checking the essential oils first. Certain skin types can have reactions to essential oils, even at lower usage rates. You may try a small test batch with a lower usage rate, or leave them out all together. That way you can see if they’re causing the redness or hives. Another thing to check is the borage. People can be sensitive to flower products. For instance, one of the employees here always has a reaction to roses. The small test batch would be helpful there as well! I have a family member allergic to coconut, even the oil! I am having difficulty coming up with a recipe for him without coconut oil. Any suggestions would be appreciated. P.s.I am just now making my way through your tutorials, so forgive me if you have addressed this. I am making bath salts for someone who is allergic to eating mandarins and most citrus fruits. Would it be alright to put lemon and orange essential oils in a product for them? 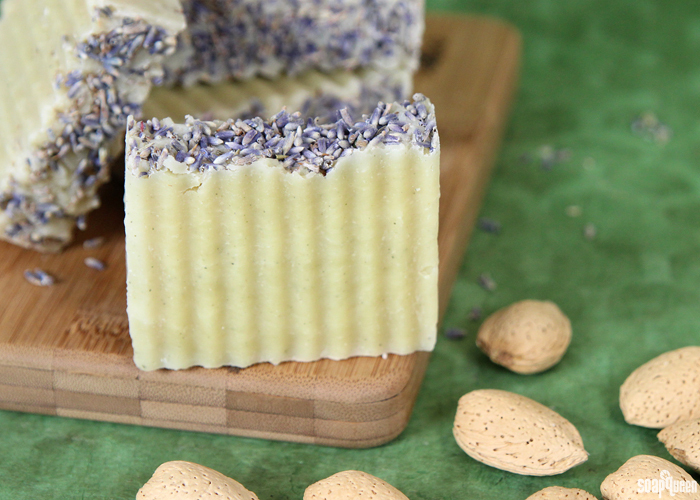 How do you prevent mold on lavender flowers in the soap? I tried using lavender flowers and after a few weeks, the mold started to form. Thank you very much! Your soap looks amazing! When using natural products in soap, they will turn brown and can eventually grow mold, especially in a wet shower environment. There is no way to prevent browning, so that is something to keep in mind. It does help to use dried flowers or botanicals in your soap. Dried flowers have less moisture going in, so that may prevent the mold for a little longer. Thank you for this information. You, the Brambleberry team or even Anne-Marie be posting some basic recipe for those with allergies? Or can you recommend a book to read for making soap for those with these allergies? Thank you again. You’re welcome! Also, thanks so much for your suggestion. We’ll definitely keep that in mind for future blog posts. Thanks for this post! I am celiac with nut allergies, and so is my child. I had no idea aran was nut derived! Is there a chance nut and Gluten warnings can be posted to the products on bramble berry? I really want to be sure of these allergens and provide safe bath and body products for my family and business. Thanks for this post! I’m trying to make a signature soap for my wedding favor, but my cousin has a severe nut allergy. Palm, cocoa, and coconut may be the next ones to add to the list! Castille soap is a great alternative, but then I run into the problem of coloring and scent! And I really wanted to make a goat’s milk soap. The beginner’s list of oils and butters was a great help, but adding an allergen index to it would really help. All of this research is driving me mental! It really doesn’t help that I am trying to make this a vegetarian and soy-free soap. Anyone up to the challenge?